This summer isn’t shaping up too well is it? There is still time of course, but one thing it does highlight, is that the media/newspapers spout utter lies when they say a 3-month heatwave is coming. Since that article the weather has done the opposite 😄. They make the stories up, fact. After 2 days of rain Thursday shows signs of a little improvement. Bright spells with some showers. These might be a bit more prolonged later in the day. Max 17°C. Windy with frequent heavy showers on Friday. We might have some thunder and lightning too. Feeling cold in the brisk westerly breeze. Max 16°C. The breeze remains into Saturday as well as the showers. These should ease later in the day but even with some bright spells it won’t feel that warm for July. Max 16°C. Sunday sees lighter winds but still with a lot of cloud and some showers. There is a risk of more prolonged rain from the southwest after lunch but this is still not certain. Max 17 C.
Looking ahead and a ridge of high pressure could build in from the southwest, briefly, so drier weather and a little bit warmer could be on the cards. Don’t get too excited though, no heatwave on the way. If you have sponsored me then thank you very much. If not then please have a read about my challenge and charity via this link; 4 Rounds of Golf in 1 day for Macmillian Cancer, thank you. Aren’t we supposed to be in a 3-month heatwave now and the hottest summer ever? Of course not, never ever believe the media who failed again last week claiming we would see cold Arctic winds with a risk of frost. Clowns. The weather’s not exactly doing much at the moment, unless you’re in the SE of England where you will see severe thunderstorms this evening and early on Thursday. Our Thursday will be a decent day. Warm sunny spells and dry. UV levels high so a decent day for sunbathing if you’re lucky enough to be off work. Quite muggy. Max 21°C. A change into Friday with a breezy day expected with showers at times. Max 17°C. Not a washout this weekend as the showers slowly ease. We will continue to see some showers on Saturday and it should feel less muggy with the breeze coming from the northwest or west. Max 17°C. Overall drier during the day on Sunday but with plenty of cloud. Some bright spells at times but cloud thicker later with some light rain late-evening or overnight. Max 17°C. Next week sees a similar pattern to the weekend continuing. Some showers with drier, brighter slots. Temperatures look to remain at the same values. It seems we’re back to a typical British Summer with cloudy skies and rain. Bar the humidity, last week and the start of June was decent so will the better weather ever return? All this week low pressure has been sitting on top of the U.K. bringing showers and mainly cloudy conditions. This continues on Thursday. Some of the showers will be heavy but not everyone will catch one. Still feeling a little muggy. Max 18°C. Friday sees little improvement. Further showery rain and not much in the way of sunshine but it should become drier into the evening. Cooler as winds slip northerly. Max 15°C. Over the weekend things improve slowly as the low pressure slips away. It will be a better day on Saturday with some bright spells with slightly cooler & fresher air. There still could be a rogue shower or two especially during the first half of the day but better than we’ve been used to. A drier evening. Max 16°C. A dry day looks on the cards for Sunday. A lot of cloud about which hopefully will break at times for some pleasant sunshine and a little milder than the last two days. Max 18°C. For next week, it looks like the weather pattern settles down a bit, <just>; so plenty of dry weather with some warm bright spells. We must note we are at a slight risk of some showers from the west at times but I am confident at this stage that it will be a reasonable week. Temperatures could slowly rise if we pick up a warmer southeasterly flow later in the week. Forecast issued at 14:05 on Wednesday the 15th of June 2016. A quick blog this evening after the afternoon was spent storm-watching and seeing a monsoon deliver 15mm of rain; 12.2mm in an hour alone (2nd highest-recorded). It’s not shifted the humid-feel just yet, but that will eventually go as we approach the weekend. Thursday will dawn misty and mild. Sunny spells during most of the day and feeling muggy. Cloud will thicken and some showery rain is expected later into the evening and overnight. Low risk of thunder and lightning. Still warm. Max 21°C. A change. If you hate this ‘tropical’ feel to the weather then finally we turn cooler on Friday. Showers will be on and off all day as we enter an mixed spell. Max 17°C. The weekend is certainly tricky to forecast but it will be unsettled and cooler than what we have become used to. Cloudy on Saturday with some rain at times. There will be some drier slots with a little brightness but gone are the hot, sunny days of recent weeks. Max 18°C. It looks like Sunday will start dry for most but more rain from the west will arrive. Possibly showery at first then heavier and becoming breezy. Max 17°C. Looking ahead and next week will be cool, possibly temperatures just below average at times, with plenty of showers. Finally we’ve had a Bank Holiday Weekend without rain and a reasonable spell of weather. 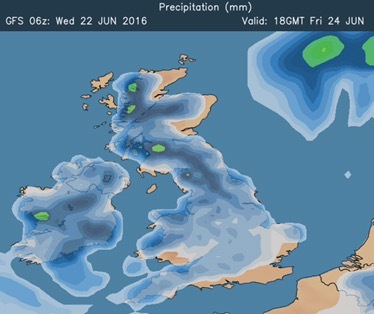 It’s not been too hot and much drier than previous months but will it continue? High pressure will be sitting to our northwest on Thursday allowing a cool breeze to develop across the region. It will also be cloudy with some light rain around but this will be patchy and not everyone will see some. Sunny spells possible into the afternoon and evening. A little cooler than Wednesday. Max 15°C. As well as it being mainly dry and cloudy on Friday some sunny spells will try to develop. Just a chance of an evening shower, but I’m not too worried for my trip to see the T20 Blast between Lancashire and Yorkshire. Max 17°C. It looks like the weekend will improve as it goes on. Saturday will be cloudy with a risk of localised drizzle or light rain early on, but skies will brighten and expect some sunny spells. These might trigger a shower or two later but the risk isn’t too high. Max 19°C. As we enter Sunday more widespread sunny spells are likely as the cloud of recent days breaks up and pleasant conditions develop. A bit warmer too. A risk of some heavy, possibly thundery showers later, especially in the southeast. Max 21°C. All-in-all not a bad forecast and as we go into next week. It looks good with warm conditions and staying dry for most. The warmth could set off some localised showers, especially on the Pennines. Temperatures should sneak into the 20s again before showery rain poses a threat from the southwest later in the week, Thursday or Friday, which could signal a change.